Because I am already pining for some debuts and sequels and such, I am going to spotlight 10 books that have a release date between December 22nd and March 21st. Feel free to just list the books you intend to read during winter! 1. Hallowed by Cynthia Hand: Well OBVIOUSLY this one would be on the list! I LOVED Unearthly and have pre-ordered this one, I'm avoiding reviews until I've read it myself, but TEAM TUCKER! 2. Under the Never Sky by Veronica Rossi: 2012 debut author, I have heard many, many good things about this book and have also pre-ordered this one :) And it especially makes me happy to hear one blogger describe it as a 'dystopian meets high fantasy' because I LOVE dystopians AND fantasy! 3. Pandemonium by Lauren Oliver: I am betting this one will be on a lot of lists doing new releases ;) I thought Delirium was amazing and that ending killed me! So yes, I am insanely jealous of those lucky bloggers who got an ARC! I am so reading this one the second it gets out! 4. Fever by Lauren DeStefano: another one probably featured on more lists than just mine ;) I absolutely loved Wither and this have another jealous moment, the same as for Pandemonium. If you haven't read Wither, you should! It's amazing! 5. Midnight in Austenland by Shannon Hale: me and Jana are fans of Austenland, she reviewed it on this blog, so when I saw this one coming out I KNEW I had to read it! Fans of Jane Austen and P&P: Austenland was such a cute read and I'm betting this one will be as well! 6. Everneath by Brodi Ashton: another 2012 debut author! This book sounds insanely amazing and I can't wait to read it! Oh, and I have some serious cover love for this one! 7. Scarlet by A.C. Gaughen: this one sounds fabulous as well, with Scarlet (I'm thinking Will Scarlet in the original story) actually being a girl instead of a boy! I LOVE the tale of Robin Hood, so I think this will be just the book for me. 8. New Girl by Paige Harbison: a YA retelling of Rebecca, you better believe I'm gonna be reading this!! So, that's my list, there are a lot of 2012 debut authors on them and some sequels and such. Let me know if I missed any! And leave your link below so I can check yours out! Unearthly, Wither, and Delirium were three of my TOP reads in 2011, so I am definitely looking forward to the second book in each of those series, too! I can't wait! First I must read Delirium and then Pandemonium. Intriguing list. and oh my goodness New Girl sounds awesome. such a good list. Yay, you mentioned Midnight in Austenland! I read it last month. :) Very cute! Your list is amazing. I'll just say ditto to pretty much everything you said! Your list is absolutely incredible. Our lists were very different outside of Fever, but you listed a lot of books that I am looking forward to. Here's to a happy winter reading season. :) Enjoy! Ha! I had five of the same books and I wanted to add an extra - Pandemonium or Bloodrose! But I forced myself to stick with ten. But this week was sooo hard! I'm super excited about the new Paige Harbison, too. I'm really looking forward to reading Under the Never Sky and Scarlet. Sad that I can't participate in this one! I already had other plans for my blog today. Great list! Cannot wait for Hallowed to get here and have been surprised that it did not appear on as many lists as I thought Also very anxious to read Pandemonium. Hope you enjoy all your winter reads. Incarnate and Under the Never Sky are also on my top ten list. They both sound absolutely incredible and I'm dying to read them!! Great list! Born Wicked and Everneath are also books that I'd love to read at some point! Also, Rebecca is an all-time favorite so New Girl is the first thing I'm getting my hands on after the holidays. I love retellings. Great TTT, a few made it onto my list as well! Pandemonium!? I want to read that one too. 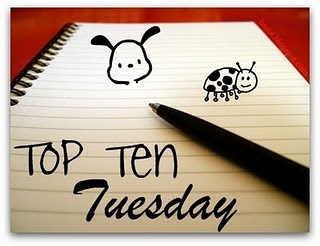 I just linked up my first top 10 tuesday post. I can't wait for "Midnight at Austenland" either. Enjoy your reading. I love how every single book you listed is on my TBR pile for next year. I hope I get a chance to read all of them! I am in the middle of Unearthly right now, so Hallowed had to be on my list. This is my first Top 10 post. Thank you! While a lot of these are not really up my alley, I did add Austenland to my BN Wishlist! Looks great! And I can totally relate to falling in love with covers. This happens to me all the time! Oooh, another Austenland book! I am mostly a library reader, so I'll have to wait a while to try most of the books on your list. But what a fun blog! It's my first week, too! The one book I'm anxiously waiting for is Broken Harbour, by Tana French. Great site! I had to make two lists, one of ARCs I *have* and one of books I don't have but want :) I also have HALLOWED, PANDEMONIUM, FEVER, MIDNIGHT IN AUSTELAND, and SCARLET on my list. They're not on my list, but I have ARCs of UNDER THE NEVER SKY, NEW GIRL, and TEMPEST to read. And I've already read INCARNATE and ADORED it. A favorite book already! So....your list could totally be my list! All of the books you listed are books on my TBR pile as well, especially Scarlet and Tempest. Can't wait for those. Hooray for there being too many good books around that none of us can keep up! Wow! GREAT choices - just added 3 books to my TBR: Under the Never Sky, Scarlet, & Born Wicked. They all look fantastic. Thanks so much! Your #2 sounds great and I'm adding it to my to-read list! Though I didn't include it on my Top Ten list, I'm so stoked to read Scarlet. I'm a little wary of Under the Never Sky, because it sounds very similar to every other dystopia being released these days, but I've added it as well. Yay, 2012 debuts! I can't wait for Pandemonium. Great list!! I hope you enjoy Everneath! It was my favorite read this year. I can't wait until its released so everyone can have a chance to read it. I totally forgot about Fever. It's probably because I don't own it yet. I'm sure it'll be bumping one of the books I have now off my winter list. ooh good list. i am dying to read scarlet as well. i love the cover. It sounds like a great list but I'm particularly intrigued by "Scarlet"!! I've heard of most of these, but not Scarlet and New Girl. This is a great list! I absolutely loved Under the Never Sky! This is such an awesome meme! I just started a blog and was looking for fun things to post and this is perfect! I can think of a lot of good top-ten lists to post on it. Thanks for hosting this meme! Is anyone else highly anticipating The Fault in Our Stars? That was number 1 on my list! The Austenland books have been on my list for awhile, especially since the BBC mini series. Love it! I loved AUSTENLAND. Didn't know there was a new book on the horizon. Great news! Under the Never Sky, Incarnate, and Everneath were on my list too! I almost added Tempest. I haven't read Delirium or Wither yet but I already look forward to Pandemonium and Fever! Oh, another one I just thought of: Out of Sight, Out of Time by Ally Carter. That one comes out March 20th. I'm so excited for it! Any other Gallagher Girls fans out there? I can't wait for Pandemonium! So excited! Also, like a doofus, I put the incorrect link up for my TTT. I filled out the linky form again with my correct url-hope that's ok! Under the Never Sky is on my list, too! I really liked this topic! Scarlet sounds interesting, but I wonder which view of Robin Hood it's going to use. I can not wait to read Hallowed either! It looks so good! Tempest was an amazing read! Kind of a new spin on time travel, with just enough romance to whet my appetite for more, and a mystery to boot. Just...emotional and wonderful. And YES to Pandemonium. I am going crazy waiting! I forgot that Pandemonium's release will be in the winter -- next March feels like SO LONG! I, too, am envious of the bloggers who get to read this early. Although, the book is being released on my birthday, which is a pretty cool gift itself. My husband will be there to pick up a copy for my b-day! Great list topic :) I've already looked at a bunch of different bloggers' list. This is my first time to join. And I had fun making my TBR list. See you at my blog! Gosh, just reading some of these lists brings back great memories! Great list :) Under the Never Sky is one of my all-time favorites - and I have to add that there's nothing "typically" dystopian at all; if you're up for it, give it a try, you will NOT be disappointed! Veronica Rossi's writing is poetry...thanks for listing some that I haven't heard of, I'll definitely check them out.